Great taillight from a great company. Why settle for the standard look when you can have something totally different. Looks, fit, craftsmanship is top notch. Don't settle for the standard. Advantages: It fits perfectly and was a dream to install. Instuction videos made it that much easier. Just do it! TST Industries has taken the competition by far with this new product. The entire journey has been a breath of fresh air. From asking the questions I had, to ordering, to the installation, I wish I could rate 6 stars. From the first day this was installed I was getting attention from people asking about it. If you are wanting a truly unique and high quality addition to your bike look no further! Thank you TST! Advantages: The sexiest tail light is definitely an understatement. This item fits PERFECTLY, everything from the connectors to the plastics going around it. Super bright. I feel a lot more comfortable riding with this light. Installation was a breeze. Took me no more than 30 minutes. Smoked lens and the design make the rear end of my bike look incredible. Everything else I forgot to mention is an advantage. This is the 2nd taillight I've installed on my 2013 ZX6R. Let me tell you, this light blows its competitors out of the water. It was very easy to install as well as to program how you wanted the light to work. The only real complaint I could say about the taillight is, the hole on top that lines up with the upper part of our rear fairing plate could be tighter. Have a little slop in the top portion of the light but not enough to cry about. Ordered the taillight, fender eliminator, flasher relay, and licence plate light. Recieved it in about 2 or 3 days. Amazing product thus far. And the fender eliminator is 10 times cleaner than the two brothers I had. Advantages: Brighter, gets rid of bulky turn signals, and the features will help make sure ppl see ya. Absolutely amazing all around! From customer service to product fitment and quality. Installation was very easy, relay easy to install as well. Looks great and having the strobing brake is a big piece of mind. Excellent product, delivered quickly, worth every penny. Just bought this for my 2013 636. Looks amazing, craftsmanship is legit af. Easy to install, plugs right in. You'll need your OEM bushing from the Original taillight but that's it. I HIGHLY recommend the relay. Don't waste your time with splicing wires and connecting resistors. Plug and play for the win! Advantages: Looks dope af, has two modes on stop light and signals. Disadvantages: Signal connectors are single wired. So if you're trying to bridge them with other signals (California residents know what I'm talking about) you'll have to splice from the base of your oem wiring. No biggie. Bought the integrated light for my Z800, what can I say awesome! I definitely recommend getting the relay they sell it'll save you a headache. Also bough the fender removal and license plate light. Company is awesome! YouTube video was so easy to follow, these guys and gals have my business as long as I own a bike. Purchased the works for my 13 zx6r, integrated taillight, fender eliminator, and the stealth license plate light kit along with the flasher relay. all that for $200. Upon arrival which was quick 2 day USPS priority shipping, everything came wrapped up in perfect boxes and bubble wrap. Install was a breeze , however my brake light stayed on. Gave TST a call and gave me some awesome options to get this brake light off. Turns out it was just the spring on the rear brake causing the light to constantly be on. My bike previously had a integrated taillight but with TST taillight makes the bike. It's absolutely perfect and i could not be happier. -must for any 13+ zx6r owner. I bought this taillight less than a week after buying my ZX6, and the decision to does so was an easy one! It has a very unique, complex look to it, without having a complex installation process. Easy to install, looks/functions great(for a couple of months, anyways), and all at a reasonable price. Advantages: Nice, unique design that I haven't seen around much on other ZX6's. Disadvantages: Less than 2 months old, and the LED's are already failing. Michael, thank you for the review and feedback. We'll be contacting you shortly to get you squared away. We can't have you riding around with this awesome of a taillight and LEDs out! 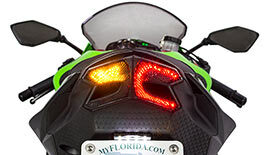 I have a 2015 Ninja 6zxr 636 and I ordered this along with the fender eliminator, universal license plate light, and the relay for the blinkers. I've got to say I was thoroughly impressed! The quality of the parts, the fit, and the installation all exceeded my expectations! I was also impressed on how quickly my order got to me. I ordered 2 days before Christmas and it arrived the following Tuesday. So I'd say 5 days total with a holiday weekend isn't too bad at all! Advantages: Install was a breeze for all of them and they look absolutely amazing! Took me about 1.5 hrs due to me not having experience with something like this and taking my time. I have never ordered anything online that I have been so proud to own! I will be recommending you guys and look forward to giving you more of my business in the future.